A Sardarji, Pakistani, Chinaman and Jimmy Sheirgill walk into a bar. The result is Happy Phirr Bhag Jayegi. And it has no punch line. Unless the bar being in China is the joke. The only joke. In which case 136 minutes of Indians singing old Hindi songs in Shanghai, screaming over one another, culturally appropriating a different language and proudly peddling their outdated racism (“Their faces are all the same” is repeated in 13 different scenes) can get more than a bit tedious. When all else fails, throw in a gay stereotype. Or an obese Muslim who thinks he is Chinese. Or an Urdu-speaking villain perpetually surrounded by sherwani-clad and kebab-eating Chinese diplomats. Or noodles. More noodles. Noodles. Jackie Chan. Mudassar Aziz’s sequel to the 2016 sleeper hit, in addition to fatally stretching the mistaken-identity and comedy-of-errors template, lazily relies on the clichés of the ignorant Indian tourist syndrome. 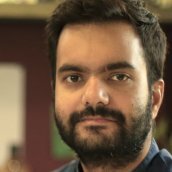 It sets the same faces loose in a developed country that makes them feel even more insecure – and therefore louder, crasser and wilder – about their Indian-ness. This one of course can’t help but be snarky about the Pakistan-China relationship – what with India, and Happy, caught in between – but unlike the first film, its politics exist out of context. There’s a plot, but it’s only an excuse to derive humour out of language barriers and overcrowded frames. Some Hindi-speaking Chinese gangsters, who are out to kidnap Happy (Diana Penty) and her singer-husband Guddu (Ali Fazal) on their arrival, mistakenly abduct another Happy (Sonakshi Sinha), who is a horticulturist on her own personal mission. Just like we supposedly can’t tell the difference between them, the Chinese can’t tell the difference between Penty and Sinha. New Happy escapes and finds a saviour in an introverted Indian Consulate worker named Khushwant (Punjabi singer Jassi Gill). The baddies also pick up local politician Bagga (Sheirgill) on the eve of his wedding and Pakistani cop Afridi (Piyush Mishra) on the eve of his retirement from Amritsar and Lahore – all because they were once friends of the Pakistani ex-governor’s son (Abhay Deol) from the first film. Go figure. Everyone’s paths cross, Khushi and Bagga vie for Happy’s love and we are given a tour of China from the perspective of a group who behave like they’re in Hangover 2 without the alcohol and magic pills. Every two out of ten one-liners land, the slapstick set pieces try too hard and the only parts worth a yen involve Jimmy Sheirgill and Piyush Mishra riffing on anything, including self-depreciatory puns on the India-Pakistan rivalry. Sheirgill’s Bagga, in particular, is such a cleverly written character – here’s a self-aware actor who has sportingly designed a legacy out of his own typecasting as the giant softy who never gets the girl. He makes heartbreak look funny, and has the wry expressions of a veteran who sees the lighter side of his failure to cut it as a mainstream lead hero. 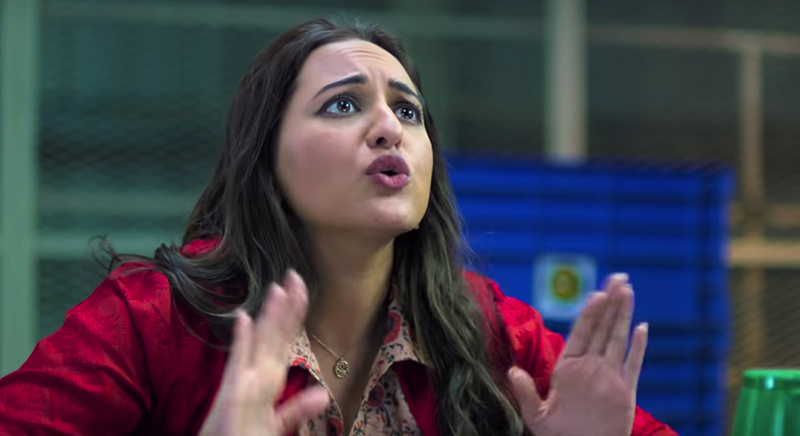 Unfortunately for him, and us, too much of the film’s two-plus hours are focused on trying to make us empathize with Sonakshi Sinha’s Punjabi accent. And her backstory. And her spirit. And her chemistry with Khushi. And her resolution. She is no Tanu, and actually drives us to miss Diana Penty’s Happy, who was ironically the weakest link of Happy Bhag Jayegi. For a critic who is currently sad, I sure am writing Happy a lot. Maybe it’ll work. But my happiness ran away because the loudest cheer in the hall came when a stock character whose first name is Fa (“Are you a soap?” asks Bagga) reveals his surname to be…Q.